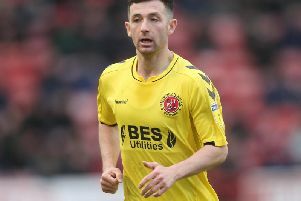 Ched Evans says being given the Fleetwood Town captaincy was unexpected but has given him an extra push for the final games of the season. It is almost a month since the striker replaced Ash Eastham as skipper, with club captain Craig Morgan out injured since January . Evans moved to 16 goals for the season by scoring both in Saturday’s 2-2 home draw with Southend, his fourth game as captain. The on-loan Sheffield United forward clinched a point with a late penalty and is revelling in the extra responsibility. Evans said: “Obviously it was unexpected but I feel I am at a stage in my career where I can deal with the captaincy. “There were times when I feel I’d step off towards the end of a game but as captain you cannot be doing that. Evans was disappointed with his team’s first-half performance against the Shrimpers but pleased with the fightback as Town picked up a point after conceding first for only the second time all season. He added “First half we were off it and we got a bit of a telling off at half-time. “I’m pleased with the way the lads reacted but we cannot concede like we did. “We came back from behind twice, which we have not done much this season. “Overall I’m disappointed. We didn’t get on the ball like we should have. There was no service in the box.